NEW 7wk & 5 day videos of most of the "A" litter before going to their new homes. Zeppe is a national level Schutzhund competition dog. His grips are textbook perfect every time and are absolutely crushing. Zeppe is a large and powerful male that has extreme speed and agility. Zeppe is truly a talented German Shepherd of the highest working quality and is also showing he can produce it. Zeppe is a half brother to 2xWUSV competitor Zidane vh Sevens. Zidane has become known as a great producer of top dogs for sport and real service work. Zeppe's dam is a half sister to Ufo van guy's Hof who is also a world class producer of top working dogs. Zeppe is also showing us he can produce top pups for all types of work. See our Past Litter page for more information on his progency. Click here to see Zeppe teaching Kurt Hidden Sleeve work! NEW: Feb. 2009 Fun outdoor Alaskan dog photos. This is the first time Zeppe was hooked up pulling the kids.. Not bad for an OLD man.. lol. Cyress is a dark sable female with nice size head/bone and a great working ability. She is a real personal protection dog.. She has a very strong crushing bite like a male and doesn‘t mess around with new helpers. She has incredible hunt drive & natural protection. Cyress is out of SG (US) Urak vom Kassler Kreuz SCHH 3 & SG Jirina vom Struwwelpeter SCHH 3. Grandfather on sire side is V Macho vom Kosakenwald SchHIII/FHI (3XBSP) Kkl1 HD A-Normal (a1) and he has produced more then 400 pups. Grandsire on dam’s side is SG Pirol vom Portnersberg SCHH 3 (LGA, FCI), IPO 3, FH 2 (LGA FH), RH 1. Click Here to see Cyress's 1st time Muzzel work 2008! 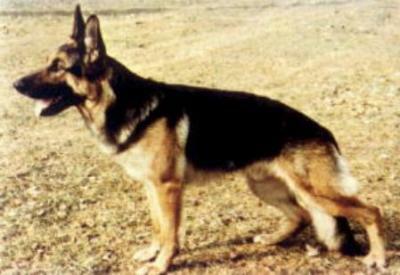 Breeding Zeppe to Cyress will bring together a great pedigree with world class bloodlines. 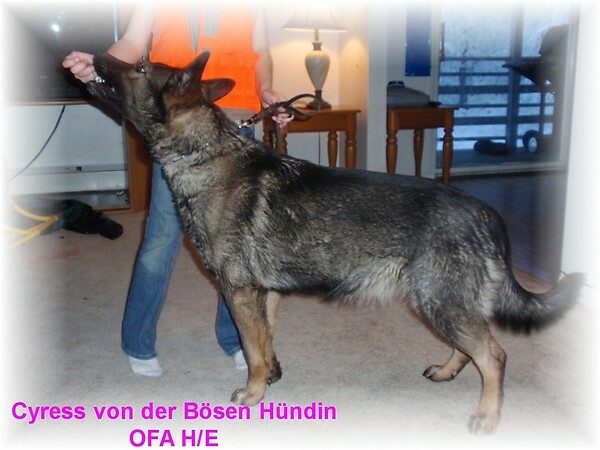 This breeding is linebred 5-5 on V Falko von Haus Sindern SCHH3 (V-LGA) FH Kkl 1 who has also produced close to 400 pups. To see this great pedigree of Zeppe/Cyress scroll down to the bottom of this page. We are expecting very strong working dogs from this litter. This litter is priced at $1000 USD. To reserve a pup from this litter you can send us a non-refundable deposit of $300. A $300 USD NON-refundable deposit will hold a reservation from this very exciting litter. NON-REFUNDABLE deposit of $300 USD will reserve a puppy. Sold to Kathryn, Mark & Boys of LA, Cal. for Family Pertection Dog. Great Job in your training Taki!! Keep up the good work.. See you on the training field. Sold to Dave of Eagle River, AK for Family Protection Dog. SOLD To Craig and Family of Anchorage Ak for Personal Protection family dog. This was after his 6wk bath..He was still a little wet. Red boy is showing high fight drives for a young boy. My sister, Mandy came to stay the weekend with her 2 wonderful chrildren.. Tristan (age 8) and Adroea (15 months). They had a great time playing with the pups. Taken on 2-15&16-2009 to see more photos scroll up. This photo was taken during labor!! Cyress is a wonderful mother. HD- OFA Fair Hips/ Normal Elbows. Mittelgroß, mittelkräftig, hoher Widerrist, flacher Rücken, die Kruppe ist leicht abfallend und sollte länger sein. Normale Winkelungen der Hinterhand, der Oberarm ist kurz und steil. Esfehlt an Unterbrust, korrekte front. Geht hinten und vorne gerade, der vortrit dürfte freier sein und der Nachschub wirksamer. TSB ausgeprägt, läßt ab.